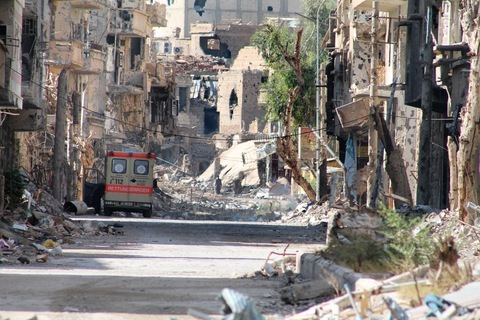 A heavily damaged street in Syria’s eastern town of Deir Ezzor on Aug. 26, 2013. Photo by Ahmad Aboud/AFP/Getty Images. An alleged chemical attack outside Damascus on Aug. 21 drew the world’s concern back to the Syrian civil war. Since news of the attack, the Obama administration and America’s Western allies have weighed how and whether to respond, including possible military action. On Friday, Secretary of State John Kerry announced that the U.S. has “high confidence” that the Assad regime used chemical arms that reportedly killed 1,429 people. You can keep up with the latest developments by following these trusted sources on Twitter, or subscribe to them via our Syria Twitter List. Also be sure to keep up with our Foreign Affairs team: @NewsHourWorld; Foreign editor Justin Kenny @JustinPKenny; deputy senior producer Dan Sagalyn @DanSagalyn; and reporter/producer P.J. Tobia @PJTobia. Andrew Tabler @andrewtabler: Syria and Lebanon expert, senior fellow at the Washington Institute. Anup Kaphle @AnupKaphle: Digital foreign editor at The Washington Post. Ben Hubbard @nytben: Middle East correspondent for The New York Times. Cara Swift? @cswift2: BBC Middle East producer covering Egypt, Syria, Yemen, Libya, Lebanon, Tunisia, Gaza, Israel. Deb Amos @deborahamos: Covers the Middle East for NPR. Fadi Salem? @FadiSalem: From Aleppo, Syria. Author and director of Governance & Innovation at Dubai School of Government. Ian Pannel @BBCiPannell: BBC correspondent. Jad Bantha ? @JadBantha: Human rights researcher and social media expert reporting from inside Syria. Joshua Landis @joshua_landis: Director of the Center for Middle East Studies and associate professor at the University of Oklahoma. Lina Sinjab @BBCLinaSinjab: BBC correspondent in Syria. Liz Sly @LizSly: Washington Post Beirut bureau chief covering Syria, Lebanon, Iraq and beyond. Martin Chulov? @martinchulov: Covering the Middle East for The Guardian. Matthieu Aikins @mattaikins: Reports from Afghanistan, Pakistan, Syria and other places for magazines including Harper’s, the Atlantic, GQ and Wired. Miriam Elder @MiriamElder: Foreign editor at BuzzFeed. OCHA Syria @OCHA_Syria: Mobilizes and coordinates humanitarian assistance in Syria. Ole Solvang ? @OleSolvang: Senior emergencies researcher at Human Rights Watch. Paul Conroy @reflextv: Sunday Times photographer covering Syria. Richard Colebourn ? @rcolebourn: BBC News Middle East bureau chief. Sam Dagher @samdagher: Middle East correspondent for The Wall Street Journal. Covering Syria and Lebanon. SANA English? @SANA_English: The Syrian Arab News Agency (SANA) is the national official news agency of #Syria. It was established in 1965. Steven Heydemann @sheydemann: Special Advisor, Middle East Initiatives for the United States Institute of Peace. Tracey Shelton @tracey_shelton: Senior correspondent for The Global Post covering Syria, Libya and conflict zones throughout the Middle East. U.S. Embassy Syria @USEmbassySyria: The official Twitter of the U.S. Embassy in Syria.